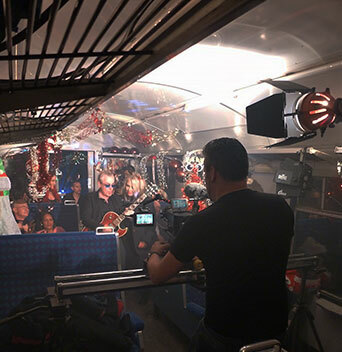 Kim Wilde & Nik Kershaw film their Christmas music video at the railway. A fun time was had by all and as part of the video they had a mock-christmas party on the train. If you looking for a friendly, accommodating, full sized railway for your next project, you have arrived at the right place. We have a 6.5 mile railway, within easy access to Central London, being under 30 miles from Hyde Park, close to the M25, M11 and A12 routes. It’s a complete private “train set”, with track, platforms, stations, signalboxes, a variety of bridges, gradients and vistas, and we have a wide variety of items to run on our railway, including steam and diesel locomotives, both mainline and industrial and a wide range of carriages from heritage to modern.